The Port of Oakland is scheduled to approve a new contract with its workers at today's board meeting, but the port — the total workforce of which is divided between the agency's own public employees, and the employees of numerous corporate contractors who run the maritime and airport operations — remains unsettled with serious labor disputes. One union is saying its workers could strike before December is over. 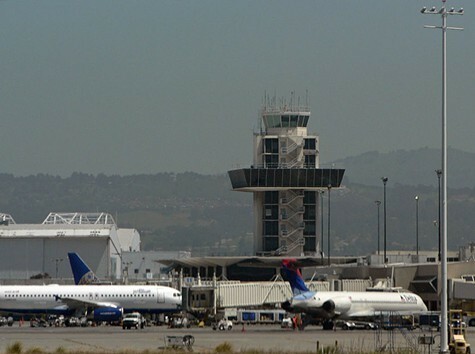 At Oakland International Airport, workers represented by Unite HERE Local 2850 are now threatening to walk off the job because of an impasse in contract negotiations with a major contractor. The workers are resisting drastic takeaways demanded by their employer, HMS Host. About two hundred unionized HMS Host employees run most of the food service operations at the airport. They work in the central warehouse delivering supplies to dozens of vendors like Starbucks, and they work in the kitchens of several of the larger restaurants like Chili's. Most of these employees make $12 to $14 an hour. According to Matt Clark, an organizer with Unite HERE, HMS Host is demanding that workers now shoulder the cost of increases in their healthcare insurance. Healthcare costs rose rapidly in the 2000s. Last year alone average premiums paid under private sector plans rose 3 to 4 percent, a significant rise even though it represented a slow down from previous years, according to the Kaiser Family Foundation's annual study of health insurance coverage. Furthermore, HMS Host is seeking to take back paid lunch-time, which would amount to a 7 percent pay cut for workers, and also is demanding a three- to four-year contract that includes no cost of living increases over its duration, said Clark. “We have called on Host to agree to a fair contract, but all they’ve offered so far are takeaways," said Marcia Voge, a bartender at the airport's Pyramid restaurant. "Now we’re preparing to do whatever it takes in our fight to win a fair contract.” Unite HERE's members have given HMS Host until midnight tonight to make a different offer. HMS Host points to a drop in passenger traffic through the Oakland Airport as the main reason for its austere proposals to the union. The company has a point. In 2007, at the height of the housing and banking bubbles, the airport saw more than 7.3 million passengers. But in 2011, the last year for which statistics are available, the airport saw only 4.7 million passengers. Passenger traffic through Oakland doesn't tell the whole story with respect to HMS Host's financial condition, however. The company actually is one of the largest food and retail services contractors in US airports, and many of its operations are in venues that have seen increases in passenger traffic and revenues since 2010. HMS Host is owned by the Autogrill Group, an Italian multi-national corporation that is controlled by the Benetton family's four billionaire scions, Luciano, Guiliana, Gilberto, and Carlo. The Benetton's control an amazing proportion of Italy's wealth, including Atlantia, the corporation that owns and operates much of the country's privatized toll highways. In a recent letter to investors, Gilberto Benetton, who lead's the family's Autogrill holdings, said that profits derived from HMS Host are up. "Travel Retail recorded excellent performance in terms of both sales and, even more so, margins," explained Mr. Benetton. "The airport channel [HMS Host] posted positive results in Food & Beverage as well, where revenues grew faster than the trend in traffic." If Wikipedia is any indicator, public sentiment is apparently trending against HMS Host. The company's current Wiki entry includes unfriendly edits, likely from disgruntled staff, that call it "low-scale," and claim that employees are 230 percent more likely to commit suicide or die from heart disease due to HMS Host's unfair working conditions.